Bravo Club, a community for the most passionate friends of opera and ballet, is an enchanting opportunity to get closer to art and artists in exclusive member events. A Bravo Club membership not only enriches your opera and ballet experiences, but also allows you to support the arts that are close to your heart. The program for season 2019–2020 will be published latest in May. 50 memberships are available for the season 2018–2019. The annual membership fee is 1 000 euros and the membership is valid for one season. Club activities take place between August and May. If you join on January 1st or later, the membership fee for the remainder of the season is 50% of the full amount. The proceeds from the Bravo Club will be used to support artistic work at the Finnish National Opera and Ballet. A more specific objective is set annually. 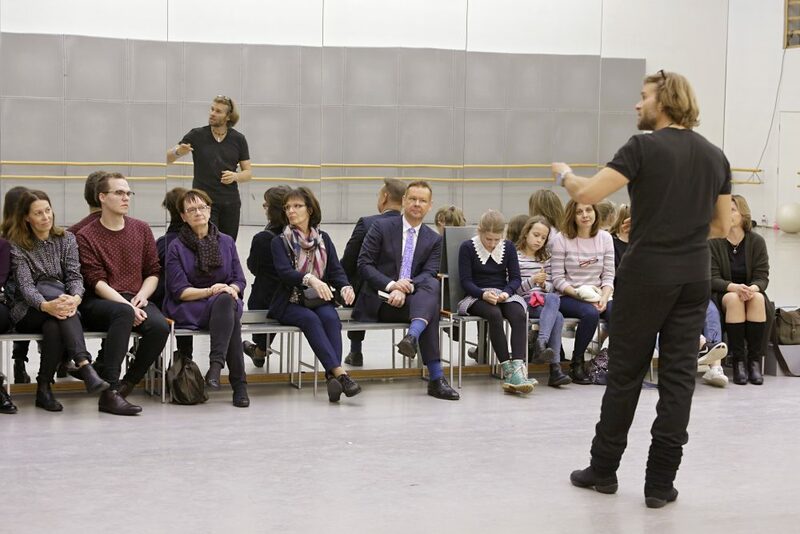 In 2017 – 2018 the proceeds supported the Finnish National Ballet’s Youth Company. A minimum of four member events are organised each year. These events are an opportunity to meet the artists and hear their thoughts on their work and upcoming productions. You will also have the chance to observe the rehearsals of different productions during member events. See an exclusive preview of the upcoming season. Get an annual tailored behind-the-scenes tour. Share the experience with a friend. Every club member can bring one non-member guest to each event. Transfer your right to attend a club event to a friend (plus one) if you can’t make it yourself. Enjoy exclusive service at bravo[at]opera.fi. Stay up-to-date about news, benefits and events via email. Help shape the future of the arts you love. The proceeds from the Bravo Club will be used to support artistic work at the Finnish National Opera and Ballet. *Read more about buying tickets further down on this page. In addition to the premieres, we have been able to secure a small ticket quota available for purchase (avec) for one performance of the Pelléas and Mélisande opera: Wednesday, 29 May. The opera is conducted by Esa-Pekka Salonen. The tickets are available for purchase on 21 January – 28 March). **Season ticket holders: To attend the premiere events, you must be a Bravo Club member and have a ticket for the premiere. If you have another season ticket type than the Premiere Ticket, you can exchange your ticket for the premiere at an extra cost. As a Bravo Club member, you can also buy additional tickets to premieres. Please note, however, that ticket availability is limited for premieres and the private premiere parties. The club membership fee is 1 000 euros per year, and the club activities take place throughout the season from August until May. The proceeds from the Bravo Club will be used to support artistic work at the Finnish National Opera and Ballet. Join the Bravo Club by emailing us at bravo[at]opera.fi. We will send you a confirmation of your membership and an invoice. A performance by the Ballet School, 14 February from 5:30 p.m. to 8:45 p.m.
Satu Ristlakki, the principal of the Ballet School of the Finnish National Ballet, will start the event at 5:30 p.m. with a talk about how the Ballet School operates. Next, at 6:30 p.m., we will adjourn to Almi Hall to watch a workshop performance by the Ballet School, in which vocational education students will be showing their choreographer skills at a workshop performance featuring a dozen modern and Neo-Classical choreographies, most of them premieres. The students have named this year’s workshop Back to Black Box. The polishing rehearsal of Sylvia, 20 February at 6:30 p.m.
We’ll have the chance to attend the polishing rehearsal of Sylvia, choreographed by John Neumeier who has headed the Hamburg Ballet for half a century. Come and see how the ballet, which will premiere on 1 March, is fine-tuned on the Main Stage on 20 February from 6:30 pm. You are welcome to bring one non-member with you to the event. Sylvia’s world premiere took place in 1876. The ballet was an important work in its time, as it paints a ground-breaking, powerful picture of women. Instead of the ethereal female characters of romantic ballets, it presented the masculine huntress, Sylvia. The polishing rehearsal of Wozzeck, 16 March from 10:30 a.m. to 2:30 p.m.
A preview of the coming season and a set design tour, 21 March from 5 p.m. to 6:30 p.m. The polishing rehearsal of Aida, 2 April at 6 p.m.
A visit to our storage in Nurmijärvi, 9 May at 4 p.m.
***This programme is subject to change. Bravo Club members Harri and Sultana Rehnberg attend the first club event of the season with their daughter in August 2017. At the event, the star of the opera Höstsonaten – Autumn Sonata, mezzo-soprano Anne Sofie von Otter described her preparation for the upcoming world premiere. The Artistic Director of the Ballet Kenneth Greve talks about Land of Kalevala in the ballet rehearsal room in autumn 2017. 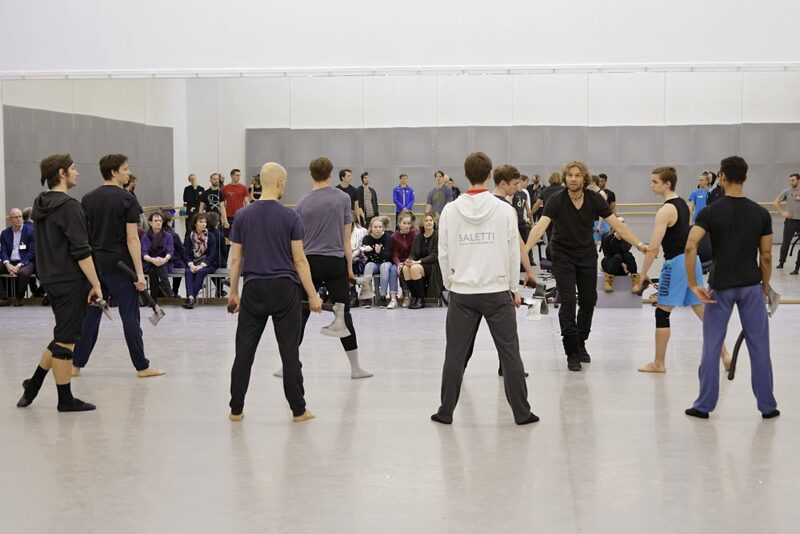 Club members follow the rehearsal of Land of Kalevala in the ballet rehearsal room in autumn 2017. 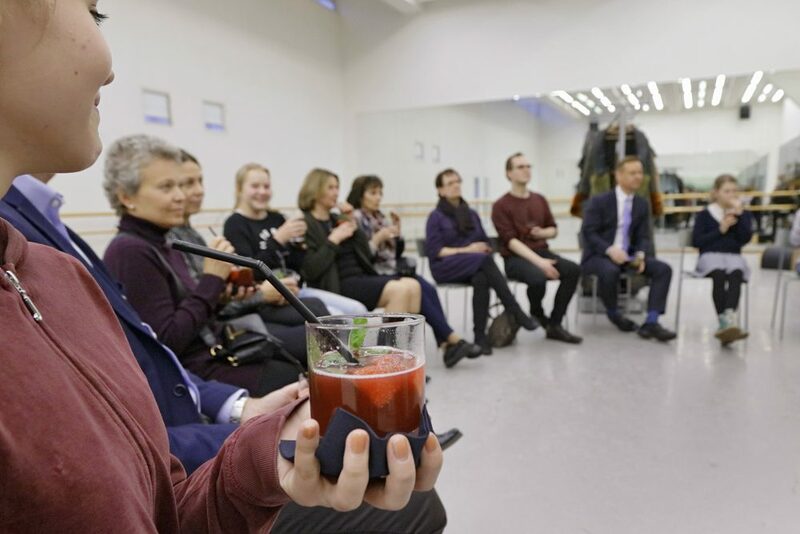 Bravo Club members meet with dancers of the National Ballet in autumn 2017. The first event of the season gave the club members a deeper insight into the opera Höstsonaten – Autumn Sonata. Mezzo-soprano Anne Sofie von Otter shared their thoughts shortly before the world premiere. The first event of the season gave the club members a deeper insight into the opera Höstsonaten – Autumn Sonata. 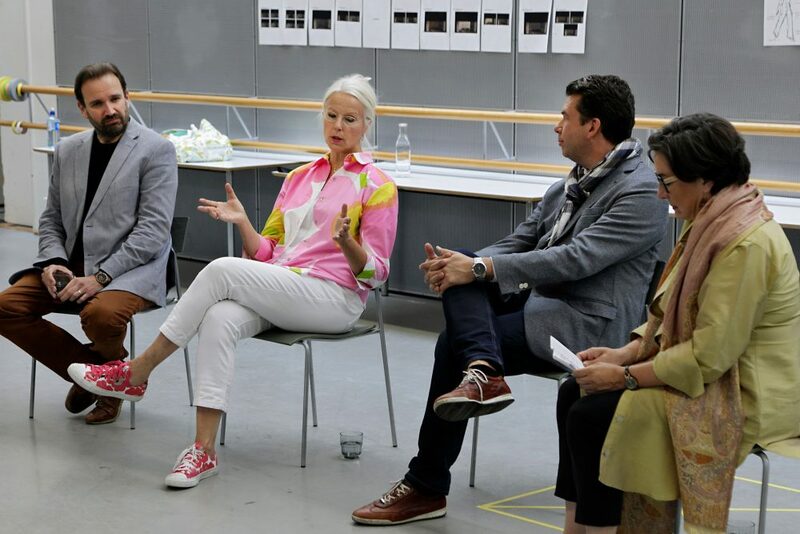 Mezzo-soprano Anne Sofie von Otter, baritone Tommi Hakala, composer Sebastian Fagerlund and the Artistic Director of the Opera, Lilli Paasikivi, shared their thoughts shortly before the world premiere. The first event of the season gave the club members a deeper insight into the opera Höstsonaten – Autumn Sonata. 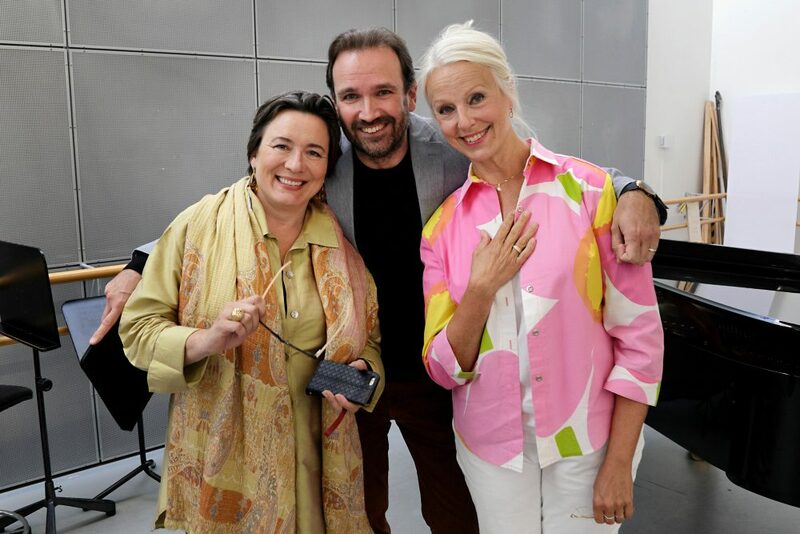 Mezzo-soprano Anne Sofie von Otter, baritone Tommi Hakala and the Artistic Director of the Opera, Lilli Paasikivi, shared their thoughts shortly before the world premiere. Escape the everyday and enjoy time for yourself. The Bravo Club is made of magical moments. Our External Relations Manager Heidi Almi and Development Manager Heidi Lehmuskumpu are at your service at the Bravo Club.